Political, Cultural and Legal Expert, Dr. Christopher Metzler will take to the stage for a one on one Politics of Cannabis discussion surrounding the medical, recreational, and statutory components of the powerful plant. Black Hollywood Live Executive Producer and Reelz Channel Television Host Derrial Christon will moderate the Q & A from 6 to 8 PM in a forward-thinking, creative environment at WeWork Pacific Design Center in Los Angeles, CA. Cannabis is a natural remedy to treat medical issues that harm us. Excited to see that America is starting to see the value of Mother Earth's medicine. 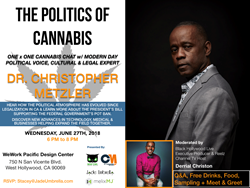 On Wed., June 27, 2018, at WeWork Pacific Design Center (located at 750 N San Vicente Blvd, West Hollywood, CA 90069), modern-day political voice, cultural and legal expert, Dr. Christopher Metzler will take to the stage for a one on one "Politics of Cannabis" discussion surrounding the medical, recreational, and statutory components of the powerful plant. Presented by Wise Owl Media Group and Jade Umbrella, Black Hollywood Live Executive Producer and Reelz Channel Television Host Derrial Christon will moderate the Q&A from 6 to 8 PM in a forward-thinking, creative environment. "Cannabis is a natural remedy to treat medical issues that harm us. Excited to see that America is starting to see the value of Mother Earth's medicine," stated Dr. Christopher Metzler. Dr. Christopher Metzler will examine the proven benefits of Cannabis for pain management, anxiety/stress, sleep disorders and correlation between those states that have reformed their medical marijuana laws and a noteworthy decline in opioid use. The audience will discover how the political atmosphere in the Cannabis space at the state and federal levels have evolved since its legalization in CA and learn more about the President’s bill supporting the Federal Government’s pot ban. Also, there will be considerable discussion surrounding the growth of the Marijuana industry on the entrepreneurial front. Dr. Christopher Metzler will speak about the new ways technology, science, and businesses are combining forces to help expand the field, including the latest advancement of his innovative health & DNA Testing Company, melixMJ. Using comprehensive genetic markers, The melixMJ. Cannabis DNA report tests how genes influence Cannabis on one’s health through a saliva collection kit. Based upon individual results, certain products may be better tolerated or more effective for specific conditions. Genes help to determine how our bodies process and rest on cannabinoids and terpenes (different compounds in cannabis). This test is revolutionary for prescription of the right strain and right dose for flower, concentrates, edibles, topical, and THC to CBD ratios based upon one's unique genetic expression. In addition to vast education, guests will have an opportunity to meet like-minded enthusiasts, thought leaders, influencers, and brands, while sampling Cannabis and hemp-infused food + drink, supplements, beauty/grooming items and more. This event will kick-off a series of ever-evolving Cannabis chats across the country featuring Dr. Christopher Metzler to help generate new paradigm change, open-mindedness, and trending conversation that combines millennials and older generations into one voice. For more information on attending this invite-only event or press/media inquiries, please contact representative agent, Stacey Barker at Jade Umbrella PR.